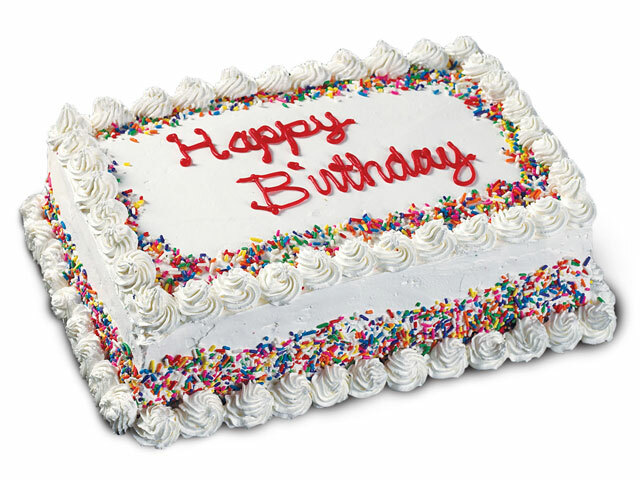 Everyone loves our Ice Cream Birthday Cakes! Whether they’re young or old, big or small, the layer of moist Rich Moist Chocolate Cake, piled high with sweet cream ice cream and topped with colorful rainbow sprinkles will leave your friends, family and co-workers breathless. If you’d like, we can even personalize the top of the cake with a custom message. We also have birthday candles available in some of our stores, so there’s no need to make a separate stop! Birthday Cakes are only available at select locations. Please check with your local store for availability. Special Orders must be made 2 days before Friday or Tuesday.